These pages introduce you to my artwork in a variety of media. Recently I have been concentrating on my unique wood paintings. However I am always sketching and working on my travel and magazine illustrations. Drawing has always been the foundation for my art, whether it be a large wood panel, an illustrated travel story, or a complex illustrated map. My background experience as an Art Director equips me to design as well illustrate. My wood paintings are currently being shown at An America Craftsman Galleries in the Sheraton Hotel corner of 52nd and 7th Avenue, New York City. Recently they were shown in a one person show at Figureworks Gallery in Williamsburg, Brooklyn. The process for the wood paintings was developed by myself in an attempt to capture the beauty and magic of the old icons and explore the beauty of the wood. 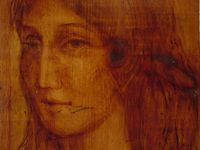 To do this requires repeated applications of oil paint and special oil mediums until a special patina is achieved. These works must be seen in person in order to fully understand and enjoy them. Examples are also shown of my illustrations and other paintings. I love to travel and have developed an approach that has led to 12 published stories on France, Greece, Spain and others. I also do work for travel, lifestyle and airline magazines. Recently I won the 2007 award of excellence for story illustration from the national APEX Awards for Publication Excellence competition. My Work can also be seen on Workbook.com. Thanks for your interest - feel free to email me at dmull@erols.com. Site and contents Copyright ï¿½ Donald Mulligan 2000-2008. No use of any image without written permission. Site by Sean.